Note: The thoughts and activities discussed in this post occurred on Tuesday, January 24, 2012. Today’s cycling trip was intended to be an extension of the inaugural trip, picking up in Sylva, NC where I ended the first trip and cycling to the little college town of Cullowhee, NC. After checking out the route with a topographic map, then by car, I decided that having only one recent trip under my belt I’d be better off reversing the originally intended start and destination points, therefore I began the trip at Cullowhee’s Catamount Travel Center and rode to the Wal-Mart Super Center in Sylva. This particular Travel Center seems to cater mostly to students from the nearby university, visiting parents, and the occasional tourist since it’s the first facility of its type I’ve seen that operates a convenience store/gas station combination with “normal” hours, and a restaurant that’s only open for breakfast and lunch. The restaurant portion is a franchise of Huddle House, which makes this locations hours especially strange. In my travels I’ve eaten at a lot of Huddle House restaurants. All but one were open 24 hours, and the one that wasn’t was open until 10pm, then re-opened at 6:00 am. I didn’t even know a Huddle House franchise could choose not to provide services during supper hours. I assumed they would at least be required to provide their customers the opportunity to have breakfast, lunch, and supper at the “appropriate” time(s). In fact, the Huddle House corporate website says predominately on their home page, “Any Meal. Any Time”. Enough said. 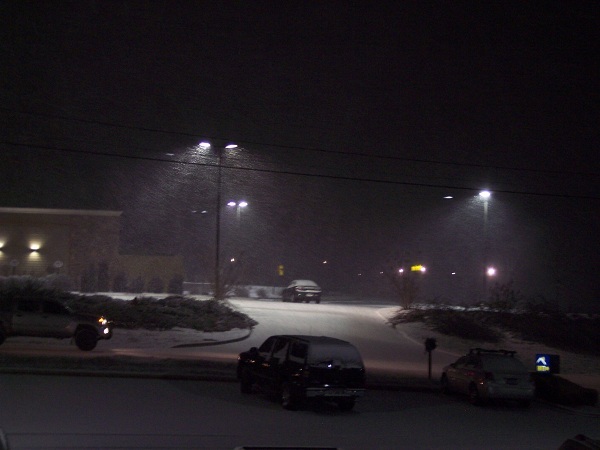 Across from the Travel Center is Western Carolina University. The university was founded as a four-year institution in 1929, however it had been various types of schools since 1888. The campus is pretty nice looking in itself, so when set against the backdrop of the surrounding mountains its beautiful. There appears to be an abundance of student housing. Several dormitories can be seen near the entrance, and there are a number of off-campus apartment buildings near by. Close to the administration building, which is at the campus’ main entrance, is a new Fine and Performing Arts Center whose opening was hosted by Jay Leno. According to a brochure the Center offers a wide range of performances and main-line guest appearances. Heading North on NC-107 the four-lane divided highway climbs gradually for about 2/3rds of a mile, at which point it flattens out briefly before beginning a long downhill grade, then repeats this pattern a couple of times. NC-107 is somewhat of a unique road. To the East/South it continues to the NC/SC state line where it becomes SC-107. Most roads, other than Interstate Highways, change route designations, i.e. numbers, when they cross a state line. 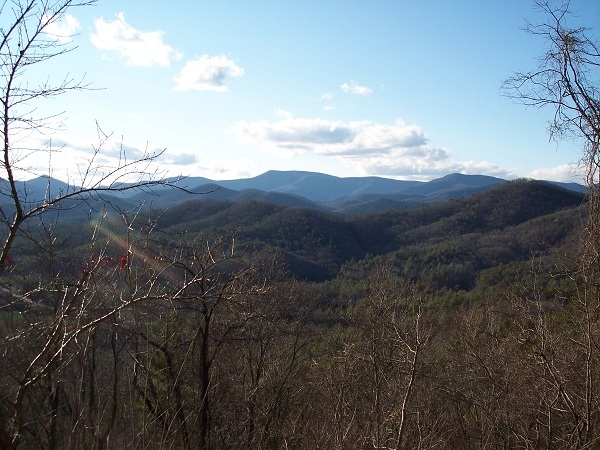 Anyway, this portion of the route is very scenic, crossing over the Tuckasegee River and offering several long-distance views of both mountains and valleys. Also, both sides of the highway have designated bike lanes for over 3/4’s of the route traveled today. 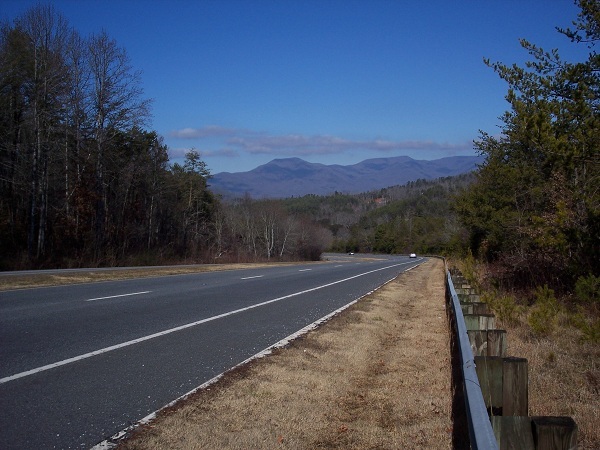 With the exception of WCU, the Travel Center, and a handful of houses the North-bound portion of the highway remains primarily rural in nature until one near the Sylva city limit. 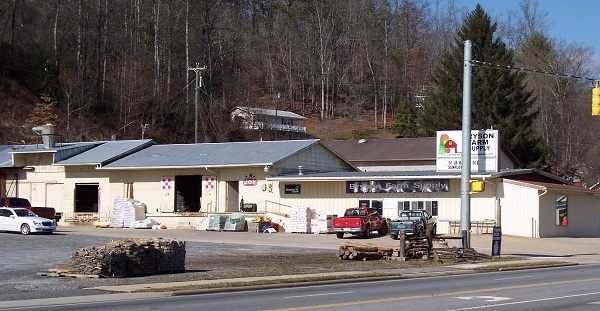 At one time there was an ice cream shop called “Jack The Dipper” on the East side of the road approximately half-way between Cullowhee and Sylva, but that business has moved into Sylva’s city limits and off the”main drag”. The building currently sits vacant with signs of some recent renovation to its exterior. Just inside the Sylva city limit, on the West side of the roadway, is Smoky Mountain High School. I don’t know which came first, the adjacent cemetery or the school (I’m guessing the cemetery), but it feels a bit strange to see a large school situated next to a cemetery. There’s nothing wrong with it, but I would assume having a school and a cemetery next to each other isn’t a normal occurrence. Across from the cemetery and high school is a Burger King, a couple of banks, a grocery store, and a Lowe’s store. A little further along there’s a family run store named Bryson Farm Supply which has been around for over 40 years. In today’s economy it’s nice to see a small business like this continue to operate. From this point on a wide variety of businesses, and even a few houses, line the highway all the way through town. I’m going to begin something new starting with this post… dining recommendations (or bad food/service) for those readers who probably cycle much further than I currently do and would like to know about a good place to eat along their journey. I may also go back to previous posts that talk about specific areas and modify them to reflect these recommendations, however that decision is still up in the air. There are two recommendations this time. The first is a Chinese food restaurant named Jade Dragon. They’ve been in business for at least 5 years. They started out as the China Dragon restaurant near Western Carolina University on Old NC-107, then recently moved to their current location on NC-107 (also known as East Main Street). The second is the “El Patron” Mexican restaurant in the Wal-Mart plaza. This restaurant is fairly new as a Mexican restaurant, however they have a long favorable history in this location as Japanese-Chinese Restaurant. Both restaurants mentioned have excellent food and great service. Oh, in case you’re wondering… I will be calling it as I see it, and will not be seeking/accepting any type of compensation for my recommendations, just a simple, straight-forward description of places visited. The total distance traveled this trip was 4.3 miles, an improvement over the first ride that was 3.9 miles. It’s not a lot longer, but having been out of cycling for so long, and starting “fresh” in the mountains, it’s not bad. Including a few stops to rest briefly or take pictures the ride only took 50 minutes to complete. The temperature started out at 49 degrees Farenheit and ended up at 52 degrees. The sky was a deep blue with only a few white clouds. The sunshine felt really good in the areas protected from the wind, however a strong breeze made other portions of the ride somewhat chilly. I’ll have to admit this ride was difficult for me, and not as enjoyable as the first ride. There were more, and longer, uphill climbs than I realized traveling the route by car. I didn’t rush, even though the total time to distance ratio was better than my first ride, but I had to push myself to keep going. A couple of times I felt like walking the bike, but if I did that then I would not have ridden the entire route, so i just took a brief rest and continued. Don’t get the wrong idea. I enjoyed the ride, just not as much as the first ride. I’m going to have to try harder to cycle more so I become better accustomed to riding and climbing hills. Taking a ride only once or twice a month will never get me in the shape I need to be in for the long-distance ride I hope to take this Fall. An Event Calendar has been created as promised and placed on its own page. Just click on the”Event Calendar” tab at the top of the page, or the “Blogroll” link in the right hand side-bar. The next event will be a cycling trip from the Catamount Travel Center (4776 Little Savannah Road- 828.293.0700 – Across from Western Carolina University) in Cullowhee, NC to the Wal-Mart Super Center in Sylva, NC. The trip will begin between 1:00 and 1:30pm on Sunday, January 22, 2012, weather permitting. Everyone interested in cycling and/or our cause is invited to attend, however please contact us by email [OldSchoolCycling at Yahoo dot Com] not later than 3:00pm EST on Saturday, January 21, 2012 to verify the start-time and to let us know you’re coming so we don’t leave without you if you plan to participate in this ride. The route, not counting any possible side trips, is a little over 4 miles. 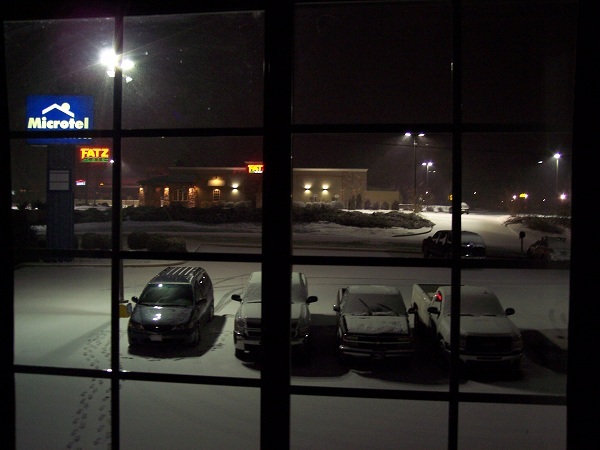 Note: The thoughts and activities discussed in this post occurred on Friday, January 06, 2012. This morning I harvested some more firewood from down the hillside in much the same fashion as described in my “A New Year’s Day Ride-Almost” post, but with one small change… I replaced one of the two heavy chains with steel cable… wire rope as some call it. The job went much smoother this time, partly because I had the routine down pat, and partly because the cable puts less strain on the winch since it’s considerably lighter and doesn’t have a hard time going over roots and other seemingly small obstructions like the chain does as the logs are pulled up the hill. After hauling up a few logs and several limbs I ate lunch, then took the Inaugural ride I had hoped to take on New Year’s Day as discussed in the post referenced above. I stuck with the decision to begin my ride from the little town of Dillsboro, NC and head east into Sylva on US-23. 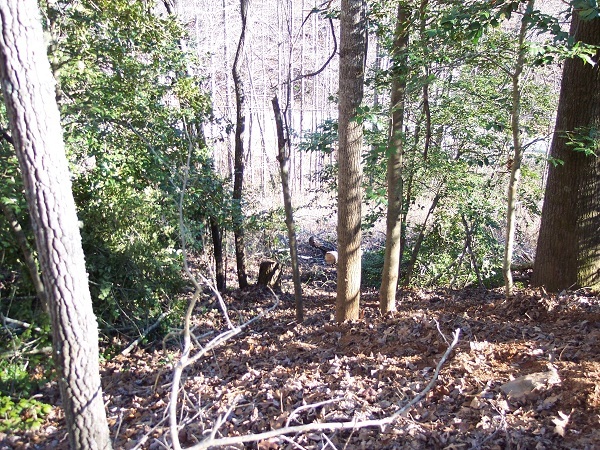 This route parallels an old, yet still occasionally used, railroad track and the Tuckasegee River. 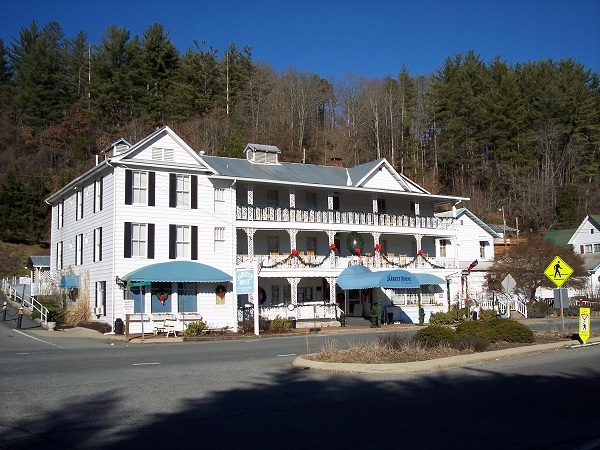 My ride started in front of the historic Victorian-style Jarrett House Inn and Restaurant which was established in 1884. During the summer this is a bustling place, and the wonderful aroma of their food wafts through the air. Like many businesses in this area they are closed in the winter. A block over (south) is what used to be the train depot, and the eastern-most starting point, for the Great Smoky Mountains Railway. The railroad is still in business, and occasionally operates trains to Dillsboro, however its primary depot is to the west in Bryson City, NC which is another area I plan to ride in. F rom the Jarrett House I rode past the former depot, then to the Monteith Farmstead on Old Home Town Road. The farmstead is now a public park and area landmark. 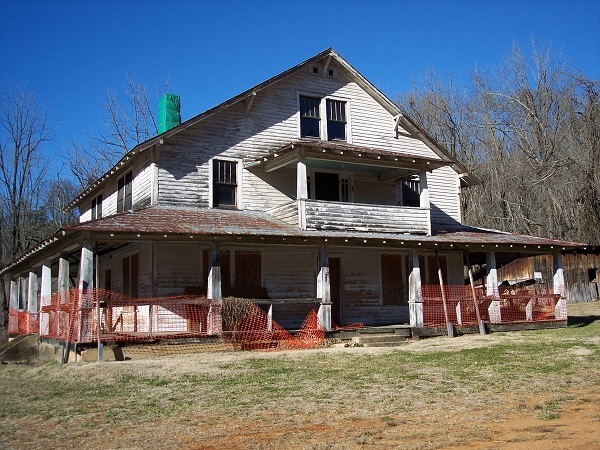 Volunteers are being used to repair the dilapidated original tow-story farm-house. Once completed the house will be used to depict life on a mountain farm in the 1800’s. The park also has play equipment for children and a bicycle/pedestrian path. After visiting this site I followed Old Home Town Road back to US-23, continuing my trip toward Sylva. A short distance from this intersection NC-107 begins/joins US-23, which breaks off about a mile away to join US-74 at the outskirts of Sylva. 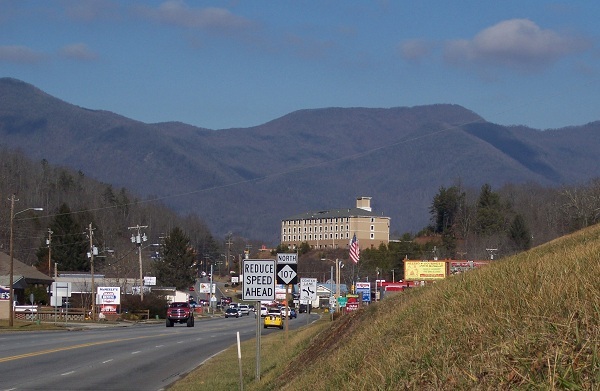 NC-107 continues on in a southeasterly direction (officially southbound) through Sylva, past the little town of Cullowhee (home of Western Carolina University), through Cashiers, then eventually enters South Carolina. As I entered the western-most edge of Sylva I came to Mark Watson Park, an old park that is home to a couple of baseball diamonds that are currently being re-graded to provide better rainwater runoff and a tennis court. What used to be the office building for the Parks Department is now closed and a debate is in progress concerning its fate. 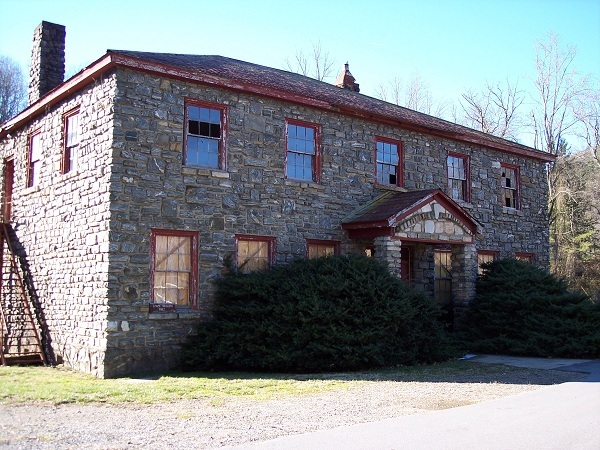 Some residents want to see it restored and used to house community-interest offices/services, others want it simply torn down and the land used for other park functions. Personally, I’d hate to see the rock structure removed. As I said in a previous post, “they just don’t make ’em like that anymore”. 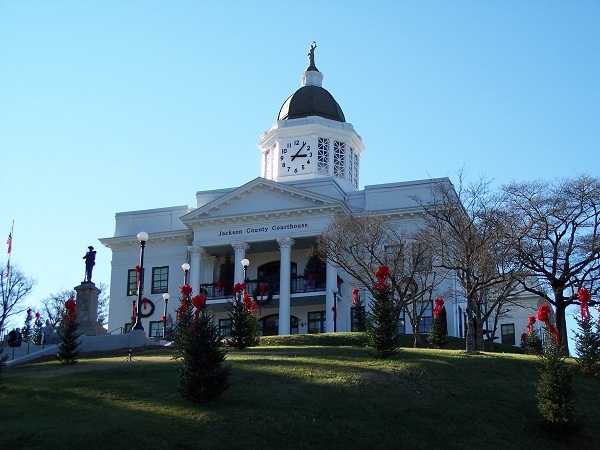 As I was leaving the park I noticed steps leading up a hillside to the back of the “old” (former) courthouse. At one time people from the courts would use these steps to gain access to activities in the park. Now they are pretty much abandoned. Next to the park is the “old” (former) courthouse for Jackson County which was built in 1913. The “new” courthouse, built around 2001, is a couple of miles away. In its day the courthouse also housed the county jail which is now in the new courthouse. Today the courthouse houses the county library. 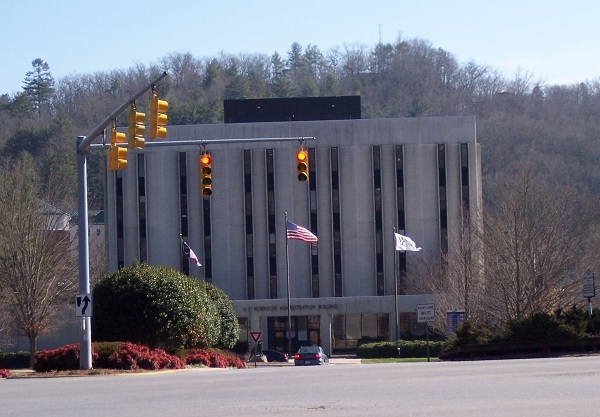 With its position atop a hill the former courthouse/library commands an impressive view of downtown Sylva as well as several miles of the town of Sylva and its surrounding mountains. To the northeast of the former courthouse, on what locals call “Back Street”, is Bridge Park where a variety of activities are held each spring and summer. About a year and a half ago a gazebo was constructed near the Tuckasegee River to allow use of the park during inclement weather. For some reason there are only benches inside. All of the picnic tables are outside. Interesting choice. I guess if it’s raining they want you to run across the bridge to use the covered picnic tables on the other side of the river. Not complaining, just calling it as I see it. 😉 On weekends during most of the summer the Parks Department sponsors local bands to perform free concerts in the gazebo. A new bridge spanning he river connects this park with a playground across the river. Back Street, actually named Mill Street, is home to a variety of small businesses including a cafe, shoe repair shop, and a trinket store. Returning to US-23/NC-107 I continued my journey eastward through downtown Sylva, passing the Motion Makers bike shop I mentioned in my “A New Lease On Life” post. 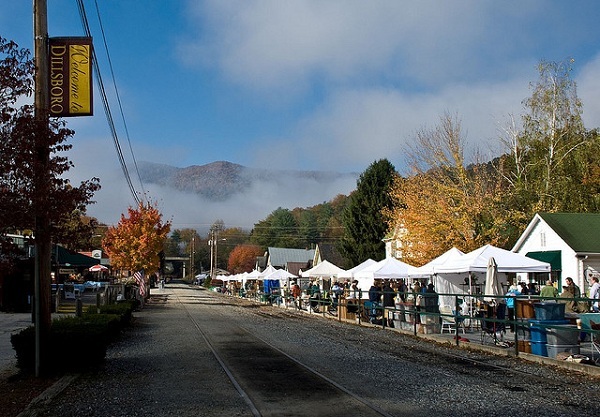 Despite its age, Sylva doesn’t have what one would typically consider a “square” like a lot of old historic towns do, just two long one-way streets that parallel each other. The town’s primary downtown businesses, and it’s oldest, are on both sides of Main Street, with smaller business on just one side of Mill Street. The other side of Mill Street is reserved for parking and the recreational park mentioned above. There’s another street literally up the hill from Main Street that’s basically a residential area, but is also home to several churches and a couple of businesses. One of these businesses is the City Lights bookstore. I had planned to visit them during this trip but forgot to do so. Hopefully I’ll remember them when I go back to Sylva to do a more in-depth exploratory ride of the town. After leaving the downtown area i came to the Jackson Paper mill. 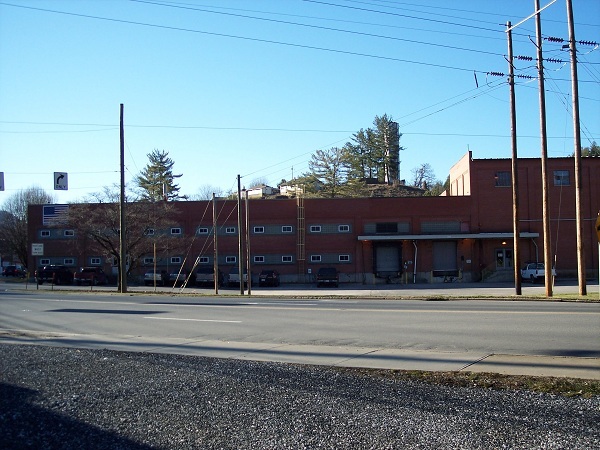 This mill is one of the leading recycled paper manufactures, and has been around since 1995. Across from the mill is a fruit and vegetable stand that’s ope year-round. In addition to these items they also sell local honey and molasses when available. Just past (east of ) these two businesses US-23 splits off of NC-107 so the balance of my journey followed the state highway rather than the US highway. One block over to the north there’s a new modern Fire Department building and local Highway Patrol office. Here is where my trip became a little tougher. The hills through Dillsboro, and up to this point, were gentle and rolling, requiring me to shift down only one gear a couple of times, however a few blocks past the mill the road begins a gradual climb, becoming increasingly steep the further one travels eastbound. Just before the Wal-Mart Super Center where I ended my journey the road finally levels out for a short distance, then appears to become a down-hill ride for about 1/2 to 3/4’s of a mile. The businesses along this part of my route are for the most part newer than those previously passed. There’s a couple of gas stations, a number of “modern” restaurants, used car dealerships, dental offices, auto parts stores, etc. The total distance traveled on this inaugural ride was 3.9 miles. Including all my stops to take pictures, and inquire about a couple of businesses, it took me an hour and a half to complete this ride. Amazingly my legs were not near as sore as I anticipated them being. The temperature started out at 49 degrees Farenheit and ended up at 60 degrees. In addition to the great weather, as the photos depict, my bike performed admirably, which borders on miraculous for a bike that’s around 18 to 19 years old and had never seen the type of maintenance it should have. It’s also not bad for the first decent length ride in years! I’m happy with the decision to postpone what would have been a very wet, cold, New Year’s Day ride until today. It’s a very rainy day here, perfect for daydreaming and reminiscing. There’s inside work to be done, however a link to a several week old MSN news article about an accident at an airport near McKinney, TX [history of McKinney] led me to a Google Maps search for its location since it is one I’m not familiar with. I grew up in that area but “things” have changed considerably since I lived there. It’s no wonder I’m not familiar with the airport mentioned, it was farmland when I cruised around those parts. This search started me thinking about the tiny community where I spent a substantial portion of my youth, the little town of Altoga, located in the gentle rolling hills of northeast Texas, only a few miles from the airport mentioned in the news article. When I was there the community consisted of 2 general stores – 1 in operation and 1 closed long ago (it is my understanding the closed one also housed/served as both a bank and a pharmacy), a doctor, a church building, a cemetery where several relatives I never knew are buried plus one I knew very well back in the day, an old yellow school bus where some of the senior residents played checkers to wile away their time, a handful of houses, and thousands of acres of farmland. I’m told there was also a public school which I don’t recall ever seeing, and several other businesses. The Ray family, who also has family ties to Altoga, was generous enough to allow me to post a couple of pictures of the Altoga high school class from several decades ago. One is posted here and the other can be found on my Old School Cycling Facebook page along with several other article-related photos. Unfortunately I have been unable to locate any photos of the school building itself. Looking at this photo made me think… the youngest person in this photo would now be around 85 years old. That’s amazing! I can’t even begin to imagine the memories they would have of their youth. How the world has changed since that time. For quite a few years the closed store still had a variety of items on its shelves, as well as a very heavily built “manual-style” cash register that still worked, and a rusted pot belly stove. 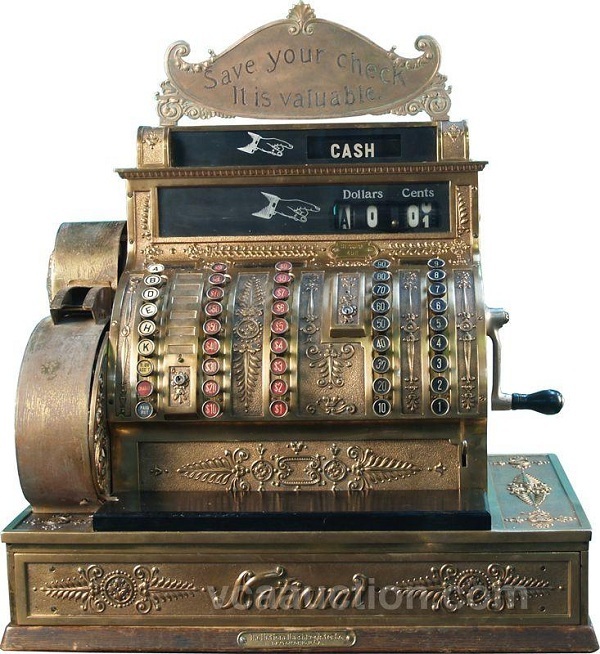 Memory tells me the cash register was gold-colored, but it was probably brass or something similar. The picture here is exactly what I remember the register looking like. The store also had a couple of places in the back where you could sneak in if you were small enough, I was, or daring enough, ditto, to play with the cash register while imagining you were selling the dusty old bottles and boxes of goods to imaginary customers. I was sorely disappointed the day I found the access had been secured, and really crushed when I looked through a window some time later and saw most of the “play things” and the cash register had been removed. I don’t know if these things were stolen or taken away by whoever owned the property, but those are two days I’ll always remember. My dad lived in Altoga as a youth, his girlfriend who later became his wife, lived on the far side of McKinney near Celina. His nickname at the time was “daddy-long-legs”. Seems appropriate since he stood about 6’6″ tall. If the stories he used to tell me about his days there were true, and I do believe they were, he was quite the rascal and I’m a chip off the old block. lol I’m particularly fond of one involving him, a neighbor and friend called “Poley”, a Model-A Ford truck (probably similar to the one pictured on my Old School Cycling Facebook page), a rope, and an outhouse. Need I say more? For those who are unfamiliar with the term “outhouse”… it’s a wooden (usually) outdoor restroom with no running water and only one or two seats. 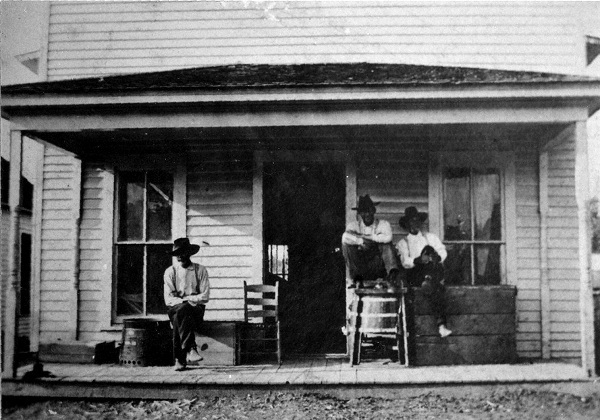 There was also one about an old abandoned house used as sort-of a community theater, a drunk, and a Cold 45… the Peacemaker revolver, not the drink. Seems my dad “shot” the drunk during a performance he (my dad) was in. Actually the drunk just thought he’d been shot, but it was enough to temporarily sober him up. I guess his getting hung up in a barbed wire fence didn’t hurt the sobering up process any either. I made my own memories with that house in the mid to late 70’s. You might call it a haunting experience. I also remember my dad telling me about a tornado that hit just outside the nearby town of Blue Ridge causing substantial damage and killing almost an entire family of 9 or 10 members, and how the citizens of Altoga went to not only feed but to help the affected neighboring residents. They rebuilt a few houses and a couple of barns, re-strung barbed wire fences, and cleaned up debris, all for no pay of course, because it was the thing to do. That was a time when communities helped other communities, and neighbors helped neighbors. “Sis” Gerron pretty much raised my dad, for reasons that never were made clear to me, or if they were explained they somehow did not make enough of an impression for me to remember. He and I always called her “Mama Sis”. When I was a youth my parents and I would visit her every few weeks and stay for the day. As a teen, then a young adult, I’d visit her alone or with a friend and listen to the stories she told about her life as a child and a young adult growing up in “Togie” as she and my dad called Altoga. Somehow I managed to start calling it “Toga”. Perhaps I just had to be different. lol Many of these visits resulted in an over-night stay in her guest room where I was treated to a very restful night’s sleep in an old-fashioned feather bed with feather pillows. If you have never slept in one of these you have missed out on a real treat. They are very soft and comfortable, sort of wrapping around you, which is a wonderful thing in the winter when there is no heat in the room. On those cold winter nights Mama Sis would always supply plenty of quilts so I was toasty warm in minutes. I remember making a sort of game warming up the bed. I’d hop in and cover completely up, including my head, then as I got one part of the bed warm I’d roll over and warm another part, or move an arm or leg to the nearest cold spot and warm that up. I never experienced a cold night’s sleep in that bed, which is more than I can say about even my zero degree rated sleeping bag. Mama Sis had the amazing knack of fitting a story about herself into what was going on with me at the time, or about when she was near my age. 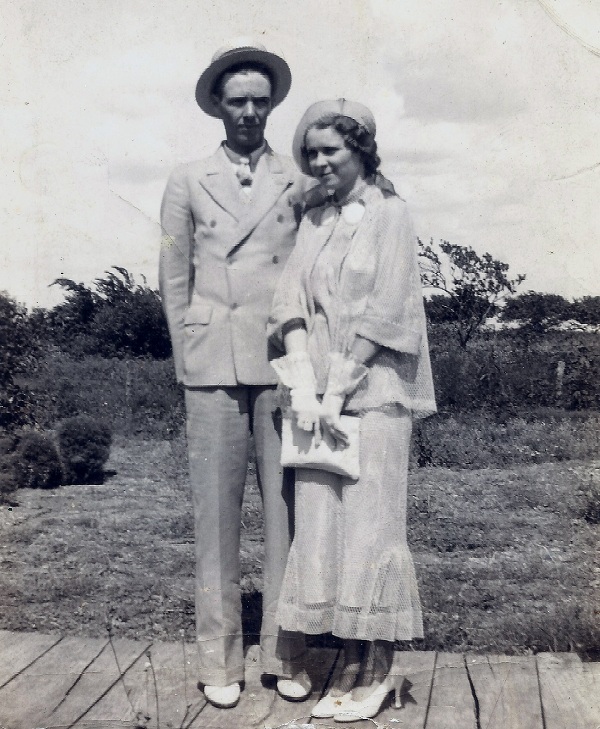 Our talks taught me a lot about life, hers and others in Altoga during the Civil War, the Great Depression, World War II, and many other stages of history up to the then current time period. 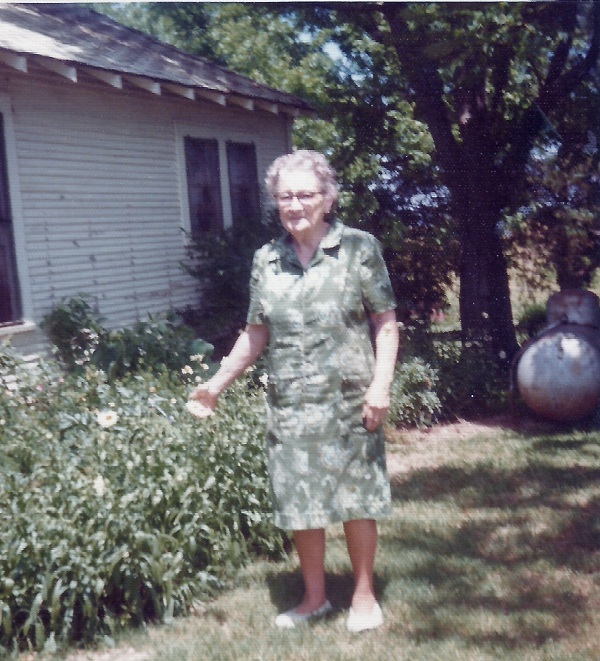 One of her stories was about the time a neighbor hired some workers to bring in their crops. One of the workers decided he’d come into her house and “take advantage” of the women who lived there. 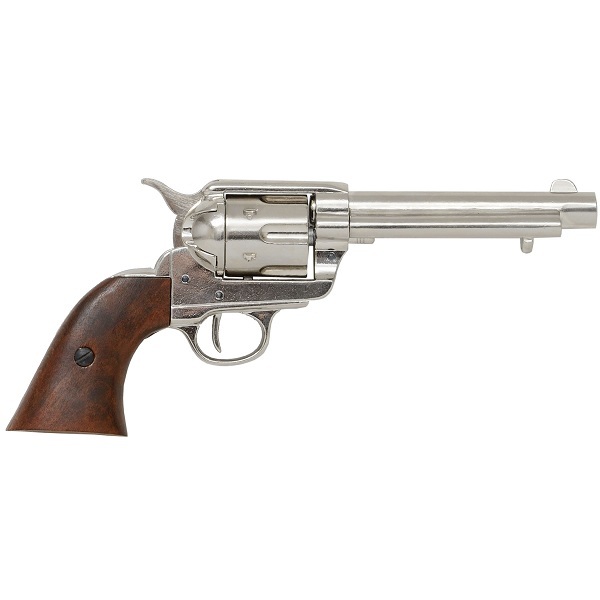 Mama Sis was only in her early teens when she shot him dead with a Colt Navy pistol, a pistol she showed me, and kept, until the day she died despite my continued efforts to persuade her to let me buy it. She said it had belonged to her father during the Civil War and she could not part with it. Her family was terrified about the repercussions they were sure she would receive for the shooting, but after the sheriff heard the story he told them the worker had been trouble since he began working in the county, he believed the women’s story, and that nobody would cause any problems over her actions. I can’t imagine the relief they must have felt. Also, knowing Mama Sis, she had to have been really upset over taking a human life. I’m going to shift gears here, then continue these recollections in another post. While I was looking up the information on the airport that started all these memories flowing I noticed a link to an announcement of a cycling trip that took place in mid 2011. It took cyclists through the rural areas mentioned above, then into McKinney. While reading that announcement I found myself wishing I had somehow known about the event and would have been able to participate. It would have been great fun to experience. Even with all the times I was in Altoga I never once rode a bicycle there. What was wrong with me? I rode almost everywhere else! Oh well, that’s in the past. What I do with the future is up to me. Hope some of you will be able to join me for some of my upcoming cycling adventures. I’ll be setting up a list of rides and locations before long so please check back for that occasionally. Please check out the full-size pictures, and some additional ones, on the Old School Cycling Facebook page. I am also in the process of moving the pics from the old Facebook page that never worked properly to the new one as time permits, so please check back periodically for those. Have you ever been stranded? I have a couple of times far away from home due to unforseen circumstances. Generally I just roll with the punches, taking advantage of a break from my busy schedule to explore a new or different area while whatever the cause is being resolved, but this time takes the cake. When I left this afternoon (Monday) to take a foreign exchange student who had been in one of our remote mountain towns to the Atlanta, GA airport for their flight home the weather was great. In fact, it was so nice I stopped to snap the first couple of pictures on the left while enroute to pick the student up. (Yes, there’s seldom a time when my camera is not within reach.) There was a chill in the air and only a few white clouds in the sky for as far as one could see from near the top of the mountain. That’s a very long view. When I dropped the student off I immediately headed back toward the house, about a 3 hour drive when there is no rush hour. The forecast this morning called for snow accumulating at the higher elevations and possible flurries at the lower ones early tomorrow morning (Tuesday) beginning around 1:00 am. We rescheduled the students flight for tonight instead of tomorrow around Noon because I knew if the snow came in during the early morning hours as predicted I would not be able to get to them. Well, the forecasters totally missed it again! It’s 10:30 pm, I’m in North Carolina less than 45 minutes from my house, more like 30 minutes plus “change” and the roads are impassable because of melting snow turning to ice. The D.O.T. has not done a single thing to the roads even though overnight snow has been forecast for 2 days, and it’s apparently fallen long enough to accumulate, melt, then freeze. This is ridiculous, and quite frankly irresponsible for the state! I considered trying to make the final few miles at a snail’s pace, but after seeing numerous vehicles in the ditch, and a couple of ambulance crews tending to accident victims, I decided to play it safe and get a room for the night. At least the hotel manager gave me a discount. Kudos for him!!! Even with all the accidents not even a county owned truck has put out sand, gravel, or anything whatsoever. I don’t know how it is where my readers are, but here law enforcement relays changing weather and road conditions to the D.O.T. so they can respond appropriately. Besides, with a system coming in like this one, they have always had crews on standby ready to roll at a moments notice. I understand Georgia D.O.T. not doing anything yet since they tend to be a bit warmer than North Carolina, even though the same problem is currently developing there, but North Carolina has no excuse. They have always “preempted” the snow and ice. Perhaps some of those accident victims can find some way to collect the cost of medical care for their injuries from the state due to their (the state, not the victims) negligence. I don’t normally feel that way since it’s a driver’s responsibility to know the forecast and adjust their travel for conditions, but in the area I was in there’s a very long stretch of road with nowhere to safely leave it, and the snows much premature arrival caught drivers by surprise. 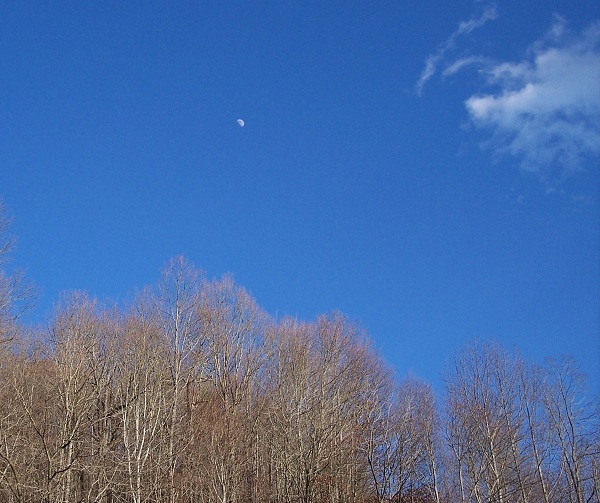 The past three days (Thursday – Saturday) here were gorgeous, especially for the southern Appalachian Mountains this time of year. Our highs averaged 56 degrees Fahrenheit, and the lows only in the mid 30’s. This is around 15 degrees above average, very much to my liking, and has very quickly spoiled me. Unfortunately the weather’s changing drastically. The forecasters are calling it an Arctic blast. Thankfully our temps are supposed to warm back up beginning this coming Thursday or Friday. Because of this great weather, and the forecast, I decided to make use of the warmer drier weather to get some extra wood for my stove, then start out the new year with a bicycle ride. My usual basic wood gathering process was described in a fair amount of detail in the “A Zero Day” post. I still only gather wood that has already fallen, from dead trees still standing and not the home of birds or squirrels, or from trees that endanger either the house I’m caretaker of or the utility lines, but this time the process was different. 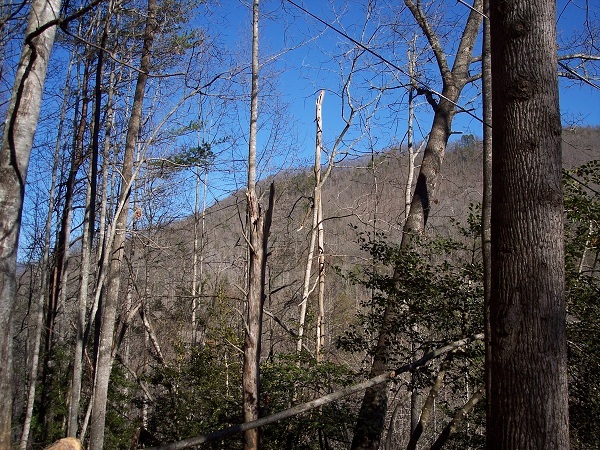 During one of the spring storms the power company, while repairing downed lines near the house, noticed a very tall tree that was leaning toward the line they were about to repair, so they cut it down before it fell over the line after it was repaired, causing the crew even more work later. The only problem for me was it landed about 50 feet down a steep hillside. Being one that seldom resists a good challenge I decided to bring the tree up the hillside rather than take it down another 70 feet or so then cross a creek with it. In order to accomplish this the decision was made to rappel down the hillside, remove all the limbs from the tree trunk, cut the trunk into 4 sections, then use my power winch to drag the logs up to level ground. This sounded a lot easier in my head than it ended up being. 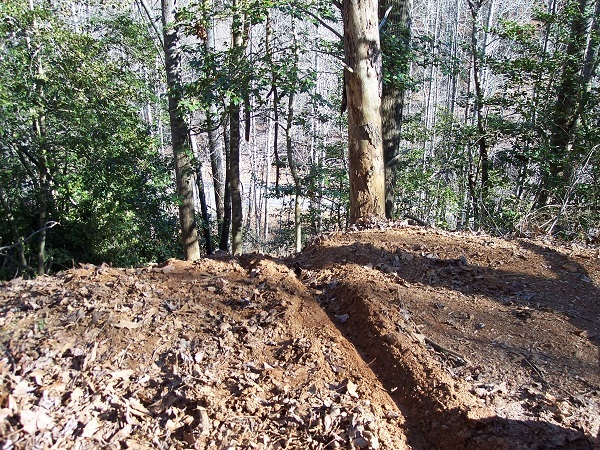 Because of the girth and density of the tree, plus the steepness of the hillside, the original sections I cut were too heavy for my 1500 pound-pull winch to handle. I suppose the weight of the chains I had to use to extend the reach of the winch added to the problem also. This mean I had to rappel back down to the tree and cut those original sections in half. Nope, still too much for the winch so back down the hillside I went a third time to repeat the process. This time everything worked as it should, but instead of needing to winch up 4 large sections of the tree trunk, plus the usable limbs previously removed, there were now 16 smaller sections to deal with, which meant many more trips down the hillside to connect the chain, then climbing back up to my vehicle to operate the winch. All of these ups and downs left a deep furrow in the ground and took most of 2 afternoons to accomplish, so once I got about half of the logs to level ground I pulled up a long forked limb, then decided that was enough for now. I know that sounds like it took much longer to accomplish than it should have, but when you have to extend that much cable in only three or so feet lengths a lot of time is wasted. The first day I did not have any help so to keep the cable from binding up on the winch spindle I had to use one hand to operate the control and the other to keep the steel cable taut by extending my arm. When I got to the end of my reach I had to stop the winch, grasp the cable near the guide, then extend it another three or four fee, stop, then repeat too many times to count. The second day I had help so the work went considerably faster since I could simply keep the cable taut by descending the hillside holding onto the chain attached to the winch cable while the winch was being operated by someone else, then ascend in much the same fashion above the log. Perhaps I’ll tackle the balance of the tree next weekend if the weather cooperates as forecast. Thankfully the remainder of the tree has been cut into winchable portions. Night before last (New Years Eve), with encouragement from the weather forecast, I decided to start the new year off right with a bicycle ride. It wasn’t going to be a 5 or 10 minute ride like I mentioned taking in a couple of previous posts, but a longer ride that would actually take me somewhere, and allow me a slower, closer look at things I’ve only driven by at “street” speeds in my car. The nearby town of Sylva, NC seemed a good prospect for what I had in mind with it’s rolling hills, no mountains to climb, and sleepy little neighborhoods on a Sunday afternoon. Not so long ago it was similar to the town of “Mayberry” depicted on the Andy Griffith television show. 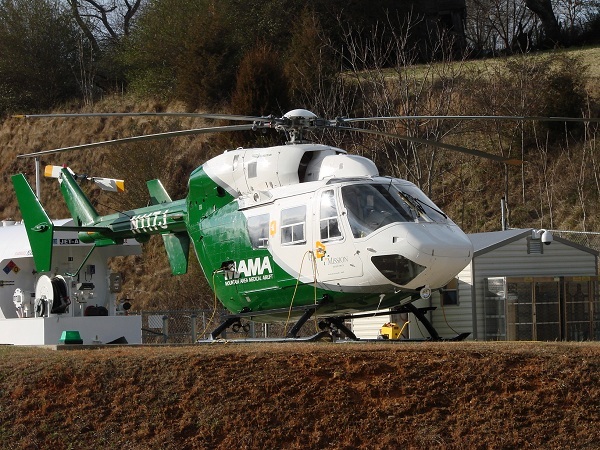 Now its a moderate size mountain town with a fair assortment of stores, a wide variety of chuches, and a regional hospital served not only by in-house ambulances but also a helicopter called “MAMA” provided by Mission Hospital in Asheville, NC. 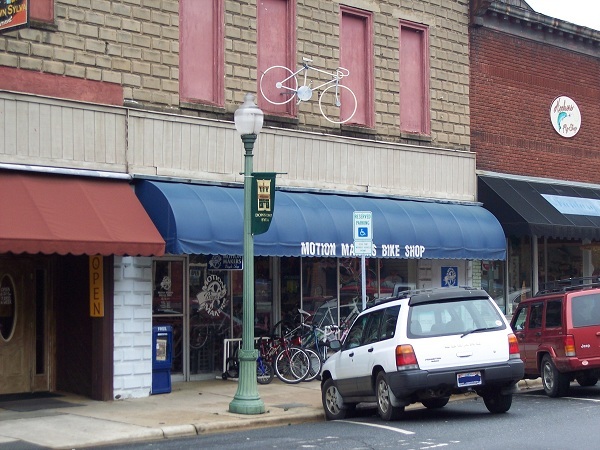 My plan was to start in Dillsboro, NC , which is a few miles to the West of Sylva, ride through the center of Sylva to the Wal-Mart Super Center while checking out a couple of neighborhoods and a few other points of interest along the way, then decide if I wanted to go further. It turned out the weather forecast was a bit off. Actually it was a lot off. I awakened to find the temperatures had dipped to 30 degrees Fahrenheit overnight instead of the mid to upper 30’s and there was frozen rain on my deck and vehicle. What a bummer! As I sipped my morning coffee the TV weather-woman said we would have brief, scattered showers during the morning followed by mostly clearing skies with a high around 60 degrees. That sounded promising so I continued thinking about the ride as I got dressed. During the trip to church the clouds began breaking off and bits of sunshine appeared. At church I noticed abundant amounts of sunshine through the windows. After church, on the drive home, the clouds began gathering again. By the time I got home the temperature had only climbed to a little above 40 degrees and the drizzle that had begun before I got to my community had turned to full-fledged rain. Needless to say, I began rethinking the much-anticipated cycling trip during lunch. By 2:00pm I could tell this was going to be a lost cause… temporarily… since the temps here begin dropping at 3:00 pm during the winter. I’ve never been a quitter and I’m not about to become one now. The cycling trip would simply need to be postponed until more favorable conditions. The afternoon was not a total loss however. I was able to knock out more of the indoor remodeling work I’ve been whittling away at as time permitted.